State BJP President Ranjit Kumar Das did not hide his displeasure of its political ally in the state, Assam Gana Parishad (AGP). 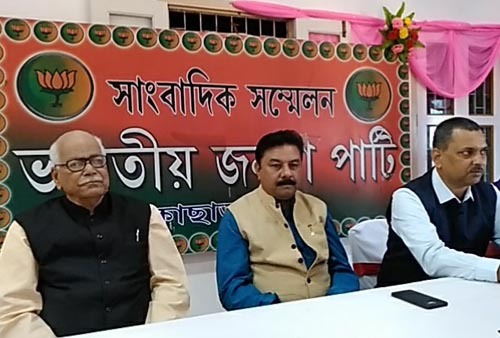 In a press meet held at Silchar on Sunday after his three day tour of Barak valley, Ranjit Das said, “Whosoever is contesting against us, is our enemy, be it the AGP or the Congress. We only know that our allies for this panchayat polls are Rabha Aikya Mancha and Tiwa Aikya Mancha. Those who are not with us are our enemies,” said, Ranjit Das. Since, 1985 no school has been opened with Bengali, Nepali or Hindi as a medium of learning and the numbers of Bengalis studying in Assamese schools are more than the Assamese community student themselves as per reports, said, Das. It also shows that everyone has accepted the language of Assamese and its ethos. There are many who even being Bengali has studied in Assamese and even went on to do PhD in this language. They have learnt and they are teaching even to this day. Have they destroyed our language or our community, questioned, Ranjit Das. “Today we should not see who is a Bengali, who is an Assamese or who is from the Hindi speaking community, to take the state forward. That is the reason why we are supporting this bill, and do not play politics over it just as the Congress party or the AGP is doing for quite some time now. The stand of the Congress party on Citizens Amendment Bill 2016, changes in Dispur, Delhi, or before the JPC and also even before local MP from Silchar, Sushmita Dev, who happens to be a JPC member. The AGP’s agitation too over it is uncalled for at a time when we are trying our level best to take this state on the path of development”. Before winding up his brief interactions with the media, Ranjit Das said, “This panchayat election will decide whether the people of Assam vote emotionally or exercise their franchise thinking logically.